This Chocolate Covered Bananas recipe uses coconut oil chocolate as the dip and can be used as frozen banana treats. Not only do you enjoy the delicious taste of chocolate but also that these are healthy chocolate covered bananas! Think whole bananas, chocolate covered banana bites, and chocolate covered banana chips. Plus it is GAPS diet legal, paleo friendly and refined sugar free. Chocolate is always welcomed at my house! Chocolate covered bananas are a real treat! Healthy chocolate covered bananas – even better! Now, bananas covered in chocolate may seem like a real delicacy. And, it is. But they are NOT hard to make. Imagine how excited I was to find a coconut oil chocolate recipe! If you missed it, you should stop right now and make Chocolate Coconut Candy with Spicy Option. This was my first attempt at a chocolate recipe to feed our sweet tooth but still be healthy. Since it was met with such approval, I became more confident to venture out and try more! 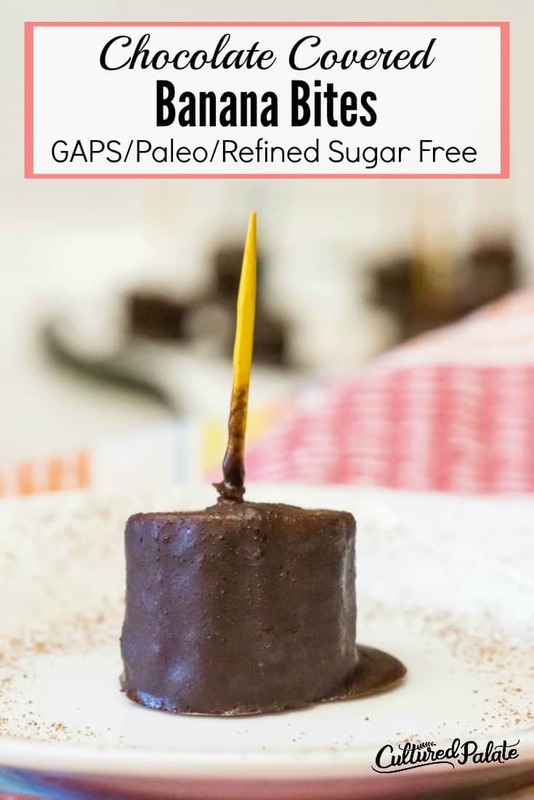 The chocolate covered bananas recipe using coconut oil chocolate coats not only bananas but any fruit well – think strawberries, grapes, pineapple… And, now don’t say “gross” until you try it, even Chocolate Covered Bacon is delicious! When I first made chocolate covered bananas, I froze them and made frozen banana treats. They were delicious. So, you can either freeze them and eat them straight from the freezer. Or, after dipping the bananas, freeze them for about 5 mins and then keep them refrigerated so the coconut oil chocolate stays solid. Either way, you have a delicious frozen banana snack or if refrigerated, delicious chocolate covered banana bites. Since our children were older when we began our REAL food journey, we have taste buds which have been influenced by processed foods. Not that we ate a diet high in processed foods and sugar especially, but refined sugar defined the “special-ness” of treat foods. So, I am always trying to find suitable replacements that will be healthy but also nutritious and these chocolate covered bananas fit the bill! For a more in depth list of why bananas are so good for you, see 7 Health Benefits of Bananas. But, here are 4 reasons you should be eating bananas just to get you started. What if My Coconut Oil is Hard? That is normal if you home is cool or the coconut oil is stored in a cool place. Coconut oil is liquid when the temperature is 75F or above. It hardens below 75F. Microwave it in 30 sec – 1 min increments. Place in a boiler on low heat on the stove. Are Bananas GAPS Diet Legal? Yes. Just make sure the bananas are ripe and have spotted skins!!! What Can I Use if I Don’t Have Toothpicks? I use toothpicks to skewer the banana bites. I have used shish-kebob sticks broken in half (using both halves) for one banana when dipping larger bananas – either the whole banana or half bananas. Popsicle sticks also work if you have those on hand. A fork will also work. For step by step pictures showing how to making the coconut oil chocolate, see Chocolate Coconut Candy with Spicy Option. Basically, the steps are Mix all ingredients well using either an immersion blender or hand mixer. Place in the freezer for about 5 mins until hardened. Recoat to get the desired thickness of chocolate. Photo 2 shows several banana bites that have one coat while the rest have a second coat. Photo 3 shows the two banana bites on the bottom left after two coats while the rest have three coats. Photo 4 shows the bottom left two banana bites with three coats and the rest have four coats. Remember, coconut oil liquefies at about 75F so it is important to keep them cool! Store in the fridge. After dipping the chocolate covered bananas is complete, pour any extra chocolate into a parchment paper lined dish and refrigerate until firm – this makes delicious chocolate candy! 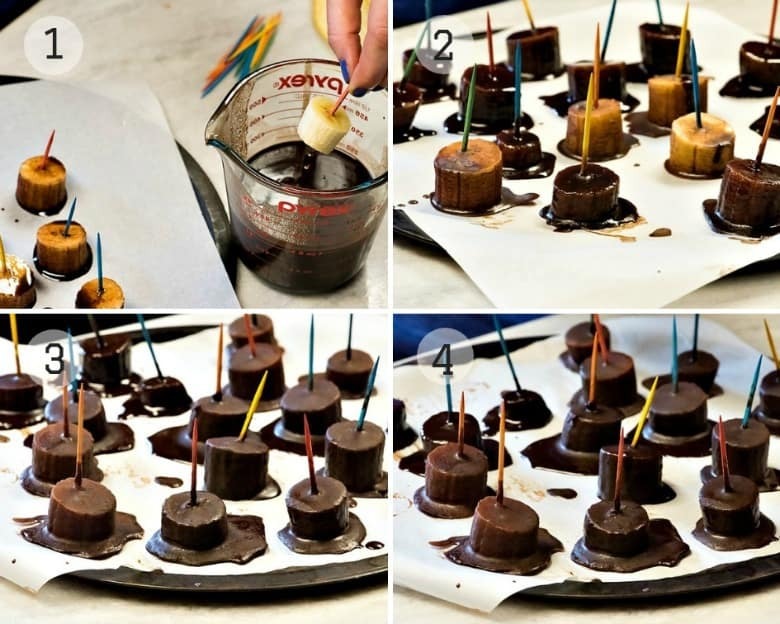 Have you tried Making Chocolate Covered Bananas? If you’ve tried these Chocolate Covered Bananas or any other recipe on Cultured Palate please take a minute to rate the recipe and leave a comment letting me know how you liked it. I love hearing from you! You can also FOLLOW ME on PINTEREST, FACEBOOK, INSTAGRAM, YouTube and TWITTER. A sweet treat. I find freezing bananas mellows out their flavor and all you taste is creaminess. Mix the coconut oil, honey and vanilla together. I heated mine in the microwave for 1 minute since the house was cool and the coconut oil was solid. Blend until well mixed - I use my immersion blender or hand mixer. Dip each banana in the chocolate mixture rotating to cover. Place each dipped banana on a parchment paper lined cookie sheet. Continue to dip and freeze bananas to reach the desired thickness of chocolate - I dipped them 4 times. After the chocolate is the desired consistency, place in the refrigerator or freeze. 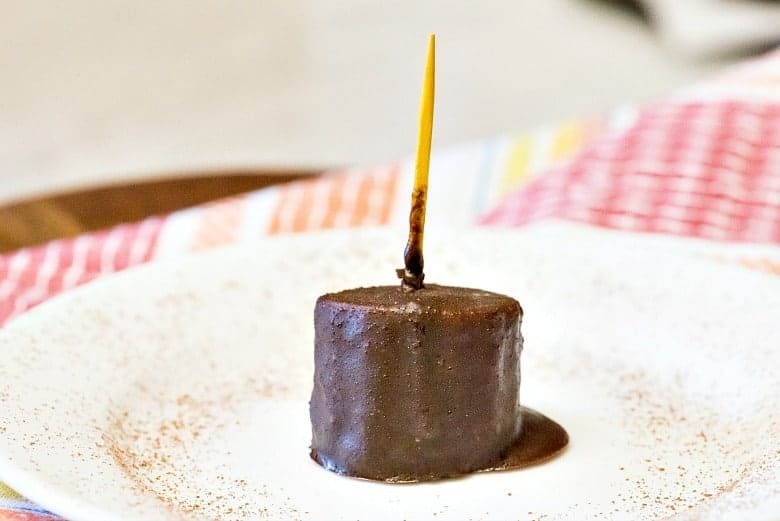 After dipping is complete, pour any extra chocolate into a parchment paper lined dish and refrigerate until firm - this makes delicious chocolate candy! Remember, coconut oil liquefies at about 75F so it is important to keep them cool! Pour any extra chocolate into a parchment paper lined dish and refrigerate until firm - this makes delicious chocolate candy! Love the idea with coconut oil and not just melted chocolate, we do both and love both. Thanks! I used this recipe for a party and they were gobbled up. I speared pieces of banana and pineapple with toothpicks and dipped them. No one even knew they were sugar free! Yummy health food! Love it! Such a great idea to use coconut oil to cover these, definitely want to make these! Such a good idea!! Can’t wait to make these for our boys! Megan, if your boys are like mine, they will love them!